It's Coming! Mark Your Calendars! Put on your best face and meet us at the Community Center! By donating needed supplies to the Ronald McDonald House you are supporting their mission to support families with a home-away-from-home while children need to be in the hospital for testing and treatment. For more information about the donations they are in need of, please visit RMHTwinCities.org/ways-to-help#wishlist. Join in the Fun on October 27th! The festivities continue back at the Osseo Community Center with more fun and games until 2P. 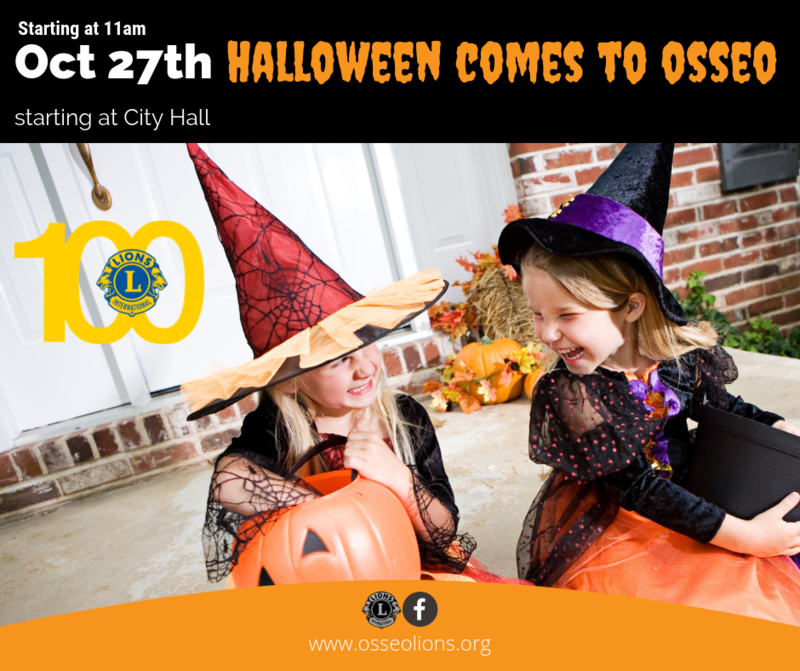 The Osseo Lions will be providing additional treats, games, and crafts. This year we will be helping the children create special cards for our Troops. Come on out for Spooky Good time! There is no need to pre-register to participate, however there are a few things we would like you to know. To participate in the Trick'or'Treat parade we ask you are out front, or have signage on your door that indicates your participation this year no later than 11am the day of the event. To participate you need to provide a treat to the children and NOT just your marketing materials. You are more than welcome to pass out branding along with your treats. If you have non-food related treats available to the children please use TEAL in your signage or a TEAL ribbon to indicate non-food related treats for the little ones. Examples of these treats might include pencils, crayons, mini notepads, stickers, finger puppets, etc. If you are a local Osseo business wanting to participate but do not have a business on Central Avenue, you can bring your temporary signage and treats down to Central Park for the Trick'or'Treators. For more information you can contact OsseoHalloween@gmail.com. Hello! My company would like to participate in the Osseo Halloween Event this year and I am looking for information on how to register for this event. Thank you! Hi Jessica! We would love for you to join us. Do you have a business in downtown Osseo? Hello Jessica. There is no pre-registration required this year for participation, however, you must be a business within the Osseo community to participate as it’s a community event. There are two ways you can participate if you own a business in the Osseo community: (1) Add your “Trick’or’Treat signage to your storefront on Central Avenue before the fun begins at 11AM — Use TEAL if you will be providing non-food related treats. You can include your branding with the treats, but you cannot just hand out your marketing stuff to the children and families participating. (2) If your business is not on right on Central Avenue you could bring your Trick’or’Treat temporary table out to Central Park in front of the Community Center from 11am to 12pm to participate. HAPPY HALLOWEEN! My company, Family Speech & Therapy Services, is interested in participating in the Lions Halloween event on Oct. 27th. How can I sign us up for this? Please call me at 612-200-0704. Thank you in advance for your help! To empower volunteers to serve their communities, meet humanitarian needs, encourage peace and promote international understanding through Lions Clubs International. We Serve. We serve our communities.